Can I order by phone or fax ? Sorry, right now we can only accept orders through our online shop. I am unable to order more than one piece, my changes in shopping cart get lost everytime I checkout. Please make sure to hit the "Update" Button in shopping cart before you checkout, else your changes will be lost. Help, I have just submitted an order but I forgot to order an item, what can I do ? Please contact us to work out an individual solution with you. We will do our best to help you. However please note that we are unable to change orders once they are submitted, we can only cancel (and refund) them completely. I am ordering for a school/company, what terms and conditions can I expect from boxtec ? Please see the application forms for educational customers or for business customers or checkout our shipping page for more information. Help, my tracking number shows no tracking since hours!! Postpac tracking numbers will only be visible at around 16:00 (CET) for the day when your order was shipped. This is because Post picks up shipments from us at around 16:00. If you feel your order should have been shipped and you have no tracking number at 20:00 feel free to get in touch with us. Please check out our Support Forum and ask your question there so that others may benefit from the answers too. I have a defective item I want to return, what should I do ? Please do not return an item without getting an RMA from our support first. Please also give us detailed information about your problem as in the majority of the cases we encounter there is a problem in the software or another component and our support may be able to work this out with you and save you from unnecessary shipment expenses. My credit card is rejected but I know the card is ok, what should I do ? Our payment gateway provider accepts only credit cards which are guaranteed. Please ask your credit card provider what kind of card you have, you might also hint them with the name of our payment gateway provider "Datatrans" to have them check why your payment was refused. Is Boxtec offering gift vouchers ? You can buy gift vouchers for any amount over CHF 20.00. 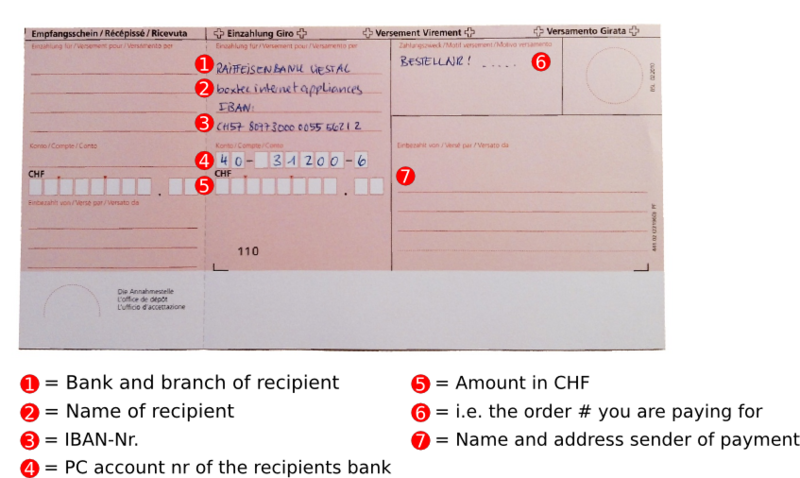 Gift vouchers over CHF 100.00 and more can be personalized. If you like to buy a gift voucher please contact us with the desired amount and your billing address. We will then send you an invoice by email including 3% prepay discount and as soon as your payment is on our account your gift voucher will be shipped to you free of charge by postal mail. Can I get an invoice please ? Each shipment will contain a printed invoice, but you can download and print invoices of all your previous orders in your account page anytime. I am unsure on how to fill out the payment slip for a prepay payment, can you help me ? Please see here for a filled example. In case you have any questions that are not answered here, please feel free to contact us.